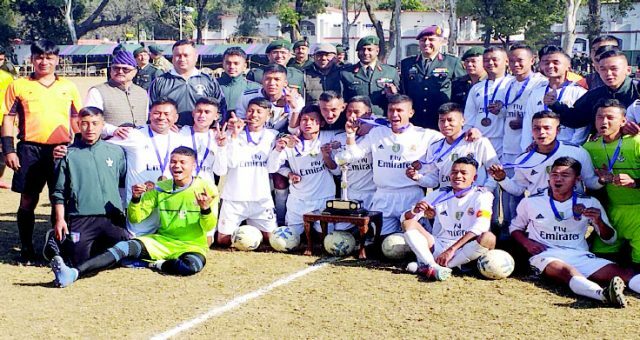 DEHRADUN, 3 Feb: The 1/3 Gorkha Rifles, Birpur, held for the first time in Doon, the ‘RAPID(S) Inter Unit Football Championship 18-19’. It was organised with the special support of the Uttarakhand Football Referee Association. The tournament began on 21 January and concluded on 2 February. As many as 21 teams participated from all over India, including 9 DH, 22 Mech Inf, 10 Guards, 68 Armd Regiment, 41 Med Regiment, 177 Med Regiment, 221 Fd Regiment, 326 Fd Regiment, 11 Garhwal Rifles, 4/4 Gorkha Rifles, 9 Mahar, 1/3 Gorkha Rifles, 17 Kumaon, 21 Bihar Regiment, 13 Dogra Regiment, 29 Punjab Regiment, 9 Engineer Regiment, 614 EME, 514 ASC Bn, 14 RSR, Div TPS. 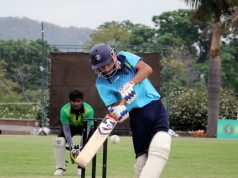 The Final Match was held between 1/3 Gorkha Rifles and 17 Kumaon Regiment. The 1/3 Gorkha Rifles won 3-1. The Best Player of the Tournament was 4/4 Gorkha Rifles Arnav. On the final day, the Chief Guest was Brigadier Subhash Panwar Dy GOC, the Guests of Honour were Major KA Prabhu and Col Pradeep Behera. The technical adviser and chief referee was Virendra Singh Rawat. The referees from UFRA were Pravin Rawat, Narendra Nanda, Aman Jakhmola, Amit Kant, Prakash and Rahul Kaintura.